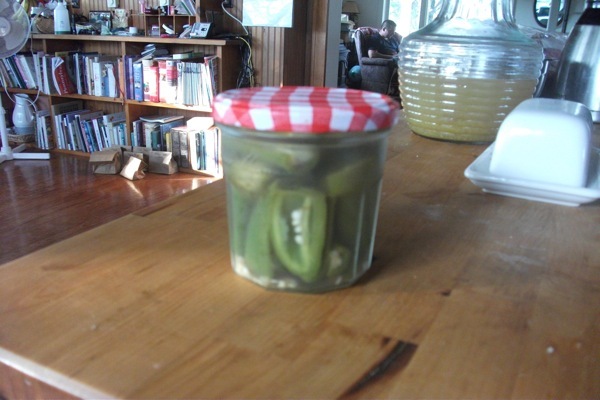 This week, I bring you the easiest pickling project I have ever done: pickled jalapeños. But, while busy, mid-summer remains one of the most rewarding parts of the season. Harvesting occurs daily, and the kitchen is filling up fast. We are eating as many green beans, beets, carrots, ears of corn, potatoes, and tomatoes as we can handle. Deliveries are beginning to get more complicated and more numerous. Nevertheless, there is an excess of food that must be preserved – and fast! Which leads me to these pickled jalapeños. After the surprise discovery of a pepper patch in amongst the weeds, I harvested a bunch of ripe and ready jalapeños that needed preserving. This recipe could not be simpler, and can be easily scaled to meet whatever number of peppers you have. 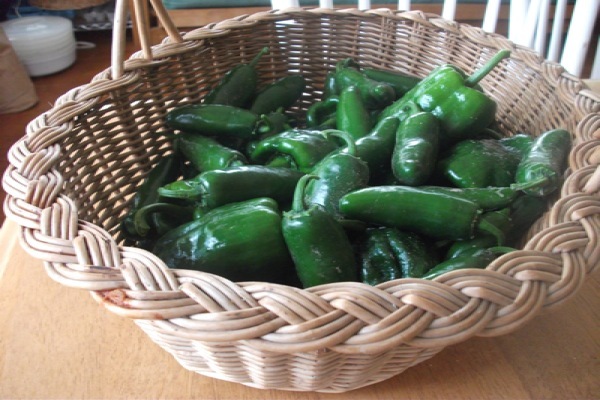 The jalapeños, now stored, will provide a much-needed change of flavor in the winter season ahead – they make a perfect addition to tacos and sandwiches, or are great for extra-special scrambled eggs. Alexis ZK is an undergraduate at New York University studying French and Food Studies. After spending a summer working on farms all over the US, she spent a year studying, eating, and working in France. Now, she has returned to the farms, this time focusing on wine and value-added products. Follow her adventures here. In a large saucepan, combine the vinegar, water and salt. Bring to a low simmer over low heat. Meanwhile, pack clean, hot jars with peppers. Pour the hot brine into the jars, leaving about 1/2-inch space between the liquid and the rim of the jar. Pop the bubbles in the jar by tapping them firmly on the countertop. Wipe the rims of the jars with a damp paper towel, and apply lids and bands. If desired, process in a boiling water canner for 10 minutes: submerge the cans in boiling water at least one inch above the top of the jars. Let the water return to a boil and then time 10 minutes. At the end of 10 minutes, remove the cans from the water and let cool. Store in cool, dark place for up to a year. You can also skip the water bath and store the jars in the fridge for up to six months.